KATHMANDU, Aug 01:The Gautam Buddha International Airport is likely to come into operation within 10 months if things go as planned. Addressing the 22nd annual general assembly of village tourism promotion forum (VITOF) here Tuesday, Minister for Culture, Tourism and Civil Aviation Rabindra Prasad Adhikari said the progress of under-construction Gautam Buddha International Airport had advanced smoothly and 55 percent of the entire works was completed. Construction of the Gautam Buddha International Airport would be complete by the end of 2018 and operated four months after the completion of the construction activities. Currently, base work of the runway has been completed and the blacktop of the runway would commence after the end of rainy season, the project officials said. Asian Development Bank and Civil Aviation Authority of Nepal (CAAN) are spending Rs 7 billion for the project, which is regarded as one of the key factors for Nepal’s tourism promotion and increased economic activities. On the occasion, Minister Adhikari said the air traffic management of the Tribhuvan International Airport had been better after running the only international airport for 21 hours a day. “Except exception, no international flight is kept on hold thanks to the effective management of the airport. Some more international flights are being added,” Minister Adhikari argued. The government has prioritized the construction of the airport in the annual budget as well as policy and programmes in order to bring in 2 million tourists in Nepal Visit Year 2020. “Airports should be increased if the number of tourists’ arrival were to increase. 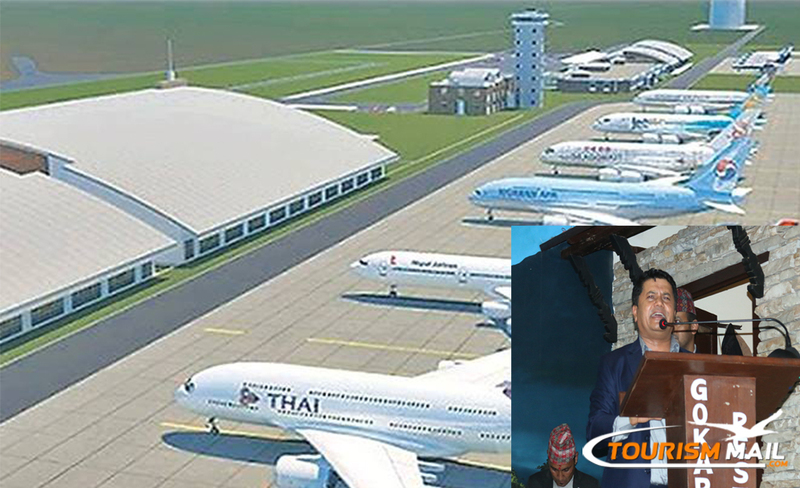 So, we have upscaled the work of airport expansion,” Adhikari claimed. Likewise, he shared that the domestic flights would start from 6:00 am now onwards and time management would be made in a smart way where the flow of the passengers is excessive. Minister Adhikari reiterated that construction of the Pokhara Regional International Airport and second international airport in Nijgadh would be expedited along with the completion of national pride project Gautam Buddha Airport. Nepali Congress leader Dr Prakash Sharan Mahat also expressed his opinion on the occasion, saying that infrastructure development should be made effective for tourism promotion.